As Minneapolis children go back to school next week, and all you southerns are already back at it, it seems a suiting time to share one of our most cherished books. It is an incredible work of art that will hold your little one’s hand through the changing of the seasons, perfectly capturing the magic of childhood, outdoor play, and the beauty of life in nature throughout the year. Text load: Beautiful, full-layout works of art alternate with a couple of sentences. It is hard to describe the magic this book envelops us in when we read it. It is the sort of book that makes you so grateful for life. The sort of book that reminds you there is so much good and beauty to be had, reminds you how magical life is in the eyes of your child, and motivates you to explore and play outside. The art! Gerda Muller’s talent for creating detailed pictures of the natural world is captivating. Though the lens doesn’t quite capture it, her lines are fine. For each season, the scenery is so beautiful, and the color so rich. 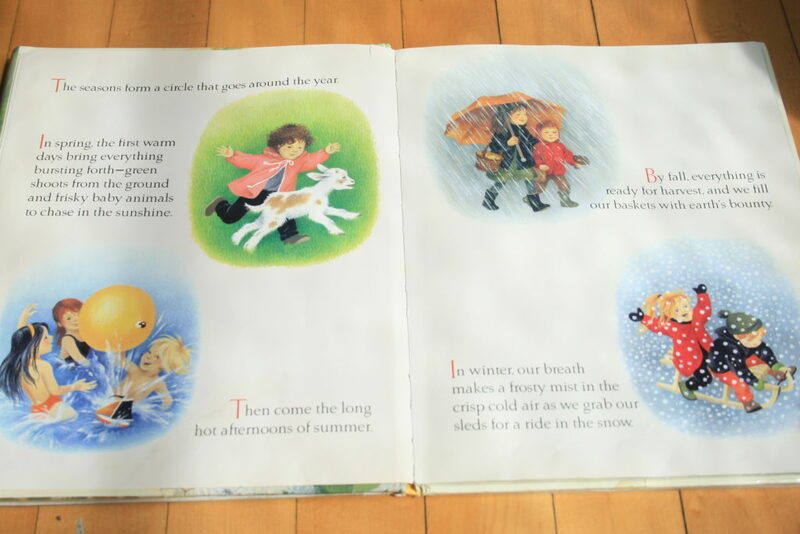 It is a simple story, really, but carries so much meaning as it walks us through the year, reminding us of all that we hold dear for each season: the newness of life in spring, summer picnics and beach play, ripening apples and playing in fall leaves, snow fun and iceskating. 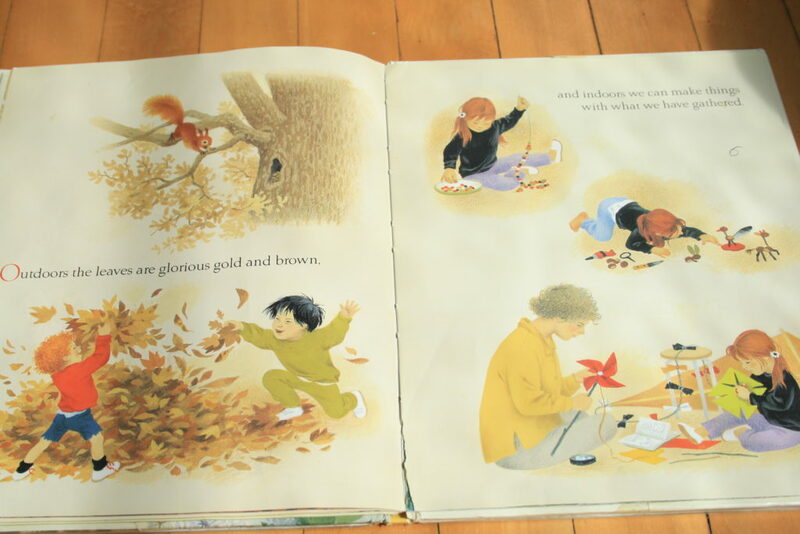 For the younger readers, this book is a wonderful introduction to the concept of “the circle of seasons.” But truly, this grounding book will last as the children grow older, too, appreciating the calm, beauty, and fun it encapsulates. As Gerda Muller says, “You know it’s fall when the apples turn ripe, the air turns brisk, and the cold rain comes tumbling down.” And so, my friends, though school is starting, it isn’t fall quite yet! I do hope you are able to savor these last summer moments. Order The Circle of Seasons on Amazon. The hardcover version of this book that we own is gorgeous, dare I say heirloom worthy. Certainly suiting for a very special gift! It can be found for purchase here. 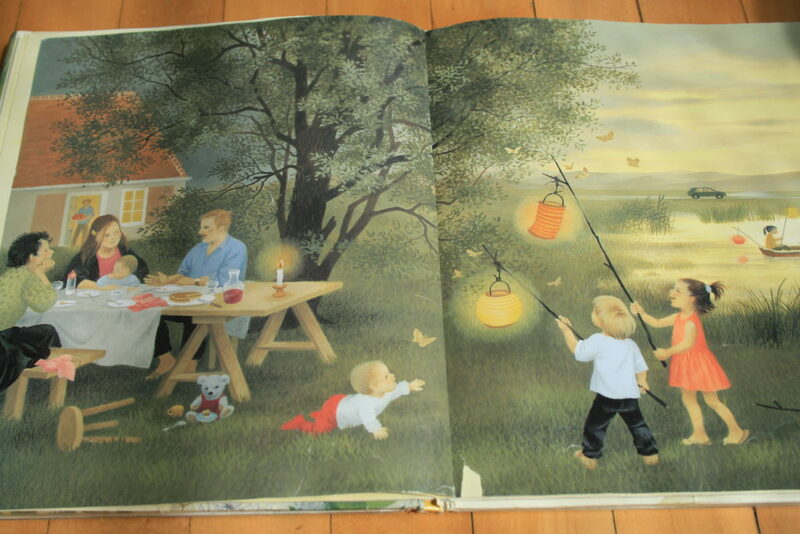 This same book is also broken up into four shorter board books, one for each season and can be found here. Nurtured by Nature Booklist: Enchanting Children with the Wonder of the Outdoors is a weekly feature here at Budding Homestead. Every Thursday, I review a children’s book from the category of gardening, nature, farming, the outdoors, and such other topics that keep the magic of this more simple life alive in us all. Each review is linked to an ever-increasing list of awesomeness on the Nurtured by Nature Booklist page found in the sidebar.